Beautiful Swarovski® Crystals from Swarovski Crystal Components, applied to the tooth in minutes without drilling or pain. 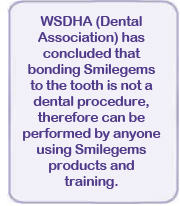 Smilegems will not harm the tooth and can last for up to one year. Begin your success story with Smilegems which will enhance your client�s smile while you enhance your profits! Step into a bright new future and just take a look at how you could increase your profit potential. For example, our medium kit contains 300 Swarovski Crystals which are available in 10 beautiful colours and 3 sizes. Each application takes just a few minutes and with a recommended cost to your client of �10 - �15 per crystal, you have a potential profit return of £2,780 to £4,280! 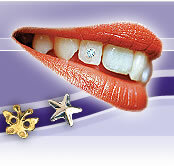 All Smilegems Professional Kits contain everything you need to provide this fabulous service. Smilegems Kits are literally a business in a box that are available in extra small, small, medium and large sizes to suit the size of your business. Our completely disposable system means Smilegems can be applied both within a salon and at outside events such as festivals, fairs and fetes. Which tribe do you belong to? or perhaps you like to stand out from the crowd? This little symbol is available in both 24ct yellow and 18ct white gold. The 'sun face' has not only in the past been vital in Pagan worship but in Inca Mythology, was recognised as the 'Divine Ancestor of the Nation'. The Smilegems Sun 3D design is available in both 22ct yellow and 18ct white dental gold. The Smilegems Diamond Paisley includes a 0.01ct GENUINE diamond set into the design. Available in 22ct yellow and 18ct white gold. Smilegems only use 24 or 22 carat, yellow dental gold and 18 carat white gold, for all our tooth gem designs.